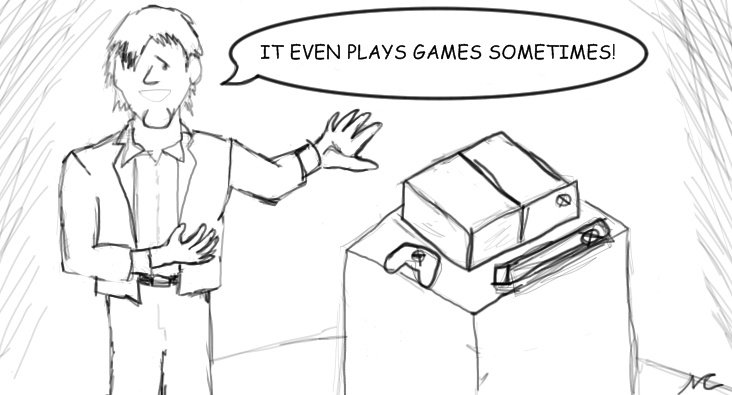 Microsoft officially announced its latest console for the next generation. Never has so little been said by so many at the Microsoft Campus in Seattle. At a brisk 60 minutes, the announcement of the Xbox One came peppered with superlatives and “game-changing” features that had nothing to do with playing games. Let me be clear, this was an event for introducing the hardware. Games will come later at E3 2013. For now, we will have to settle for the nitty-gritty. The console’s name, shape, specs, UI, and startup time were presented. We weren’t given a price or an official release date, but we did learn an intriguing number—fifteen. Fifteen first-party games will be released within the first year of the Xbox One’s life (or what Nintendo calls “launch window”). Eight games will be brand new IPs like Remedy’s newly announced Quantum Break that mixes live-action footage with gameplay. It resembles Beyond: Two Souls in many ways except for fact that people will want to play Quantum Break. If Microsoft will have eight new franchises this year, then what established franchises will make up the remaining seven? Forza Motorsport 5 was officially announced at the event and Halo 5 is all but guaranteed for a release by the 2014 holiday season. So what can fill those last five spots? Killer Instinct 3 has been rumored for years. A fighting game that runs on nostalgia could fill a need for Microsoft’s line-up. Kameo: Elements of Power has been dormant since the Xbox 360’s launch. New hardware gives Microsoft a chance to re-imagine a game that may not have received the attention it deserved. The Kinect wouldn’t have been such a success without the inclusion of casual games that younger kids could literally jump in to. Expect Kinect Sports and Kinectimals to get sequels whether you want them to or not. Microsoft has a drought of original IPs, so this final prediction may come as a shock. A new Microsoft Flight could be an impressive showcase and testament to the power and intricacy of the new Kinect. It would also appeal to a crowd that doesn’t normally play traditional games and have few options for flight simulation. It’s simply too early to tell what Xbox One will turn into. Fifteen first-party games in a twelve-month span is a good start. As I look at my list of seven franchise games, I can’t help but feel underwhelmed. Microsoft’s past doesn’t lend itself to an exciting future. If it wasn’t for Halo, Xbox would not have survived. Gears of War did the same for Xbox 360. If Xbox One hopes to live through this next generation, it will need at least one killer app on the level of a Halo or Gears that can capture the imagination of consumers who have grown tired of Halo and Gears.